A collection of herbs in containers in a sunny place near the house is a great asset for both garden and kitchen. The downside is that many pot-grown herbs die out in winter. However, they can be harvested in autumn and stored for use throughout the winter season. Most herbs are suitable for container cultivation. They can easily be sown from seed or bought from nurseries or garden centres. Beware of the pot-grown herbs offered in supermarkets, as they are usually grown under glass and are often too lush and stressed to adapt well to life outdoors. 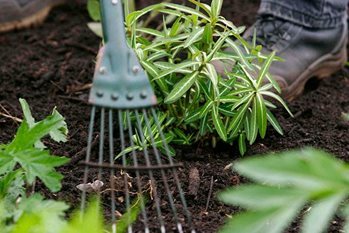 Sow tender herb seeds such as basil, marjoram, coriander, and tender perennials such as French tarragon indoors in spring for planting outdoors after all risk of frost passes. Some herbs can live outside all year once they are established. Try mint, oregano, rosemary, thyme and sage. These can be sown indoors as with the tender herbs, or sow them outdoors in May in containers. Delay buying herb plants from garden centres until the weather warms up in late spring. Winter planted herbs are vulnerable to root damage in the cold wet potting media. Herbs are usually straight forward to propagate. Choose containers which give herbs a deep root run where they can be left undisturbed. ‘Long tom’ pots have the required depth and look good massed together. Some herbs die back in winter, for example French tarragon and mint. These and most herbs will look after themselves if placed where they cannot be frozen, saturated by rain or allowed to become too dry. Suitable places include in the rain shadow of walls, in a coldframe or even in an open fronted shed. A sheet of glass or plywood can keep off heavy rain in wet regions. Use pot feet or stand containers on bricks to avoid waterlogging. If very cold weather is forecast, protect containers from freezing by wrapping in bubble polythene. Some tender herbs such as basil can only be grown if brought indoors into a warm, bright frost-free greenhouse, conservatory or a sunny windowsill. Although herbs are largely trouble-free look out for rosemary beetle, sage leafhopper, slugs, snails and grey mould. Herbs can easily rot off if overpotted.